add living space and without increasing your home’s size. Our team can transform your current basement into a playroom, home theater, office or additional bedroom. A bathroom remodel can offer a tremendous return on investment and be customized to meet individual needs and style preferences. The possibilities are endless and our experienced design experts can guide you through the process. A modern kitchen is not only used for meal preparation, but also acts as the “heart” of your home. Easily one of the most popular remodeling projects, a kitchen remodel can allow you to imprint your personal style into your home. If you are considering selling your home in the future, an updated kitchen can also help your home standout from the pack. Our experienced team can help you make your garage, flooring or painting project a reality. 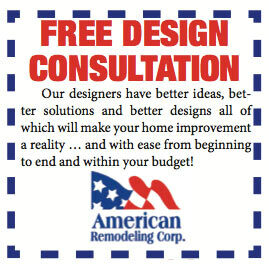 Regardless of how small, American Remodeling Corp. has the talent and craftsmen to make your project a success.